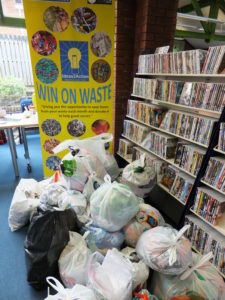 It was a record-breaking Saturday for Broadstone Win on Waste held in Broadstone Library on Saturday 7 April. 192 households donated on the day, or in advance, 72 carrier bags of waste to help 13 good causes. 60 bags contained plastic. It was a very busy session with people queuing to donate! Photo shows some of the bags. This entry was posted in Latest News, Win on Waste - Broadstone on April 9, 2018 by Monique Munroe.